Gavin Whyte breaks the deadlock for Crusaders against Ballymena United. Pic by Pacemaker. Just 10 games to go and Crusaders have posted a 21st win of the campaign as they aim to make it a trio of title triumphs in consecutive years. Only two teams - Linfield and Belfast Celtic - have ever achieved three titles on the trot. The Blues are the only team left chasing Crusaders this season and sit seven points adrift at present. The Hoops quit the league in 1949 with the Crues admitted to it to replace them, so there would be a certain serendipity if Stephen Baxter’s boys repeated their triple title success. The Crues boss was pleased that his charges got back to winning ways against Ballymena on Saturday. 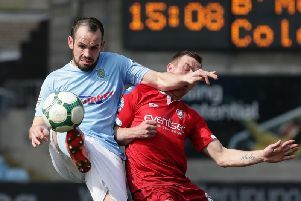 “We talked long and hard about making a fast start to the game after the disappointment of conceding two goals in the opening 10 minutes against Linfield in the Shield final last Wednesday,” said Baxter. “We did that and were on the frontfoot from the start, we got two goals and might have had four others in the first half, we were that good. “We knew it would be tougher after half-time when we were playing into the breeze but we weathered that storm well too. “They got a wonderful free-kick goal from Tony Kane but then Jordan (Owens) might have got a third for us near the end when their keeper Ross Glendinning made another fantastic save. “I think Ballymena must be the surprise packet of the season. United keeper Ross Glendinning produced a superb display between the posts. Goals from Gavin Whyte - on 33 minutes - and David Cushley - with a defelcted volley - handed the Crues control. Tony Kane’s 18th goal of the season - a spectacular free-kick 12 minutes from time - set up a grandstand finish. But the Crues saw the game out. Ballymena boss David Jeffrey admits that he had anticipated Crusaders’ flying start to the match. “We got exactly what I predicted from Crusaders at the start of the first half because they were obviously hurting after that defeat to Linfield,” said Jeffrey. “It was only the class, the sheer unadulterated class, of Ross Glendinning that kept the scoreline respectable. “He made save after save and that, plus the fact that we defended like tigers, kept the score at 2-0. “I have to say that their second goal should not have been given because we should have had a free-kick before the ball ever arrived at David Cushley.